After a short burst of chest pains followed by days of food tasting bitter on my tongue, I had reason for concern. A few days later, I went to see my long-time doctor who is both knowledgeable and attentive, and after a diagnosis of severe acid reflux, this gastronome was relieved to hear that the effect was only short-term (bile on the tongue would have that effect) and my palatal glands had not suffered any permanent damage. So, after an invitation to dinner by a friend to a restaurant unbeknownst to me, I did not resist nor google the restaurant, leaving this usual control freak to the hands of another. 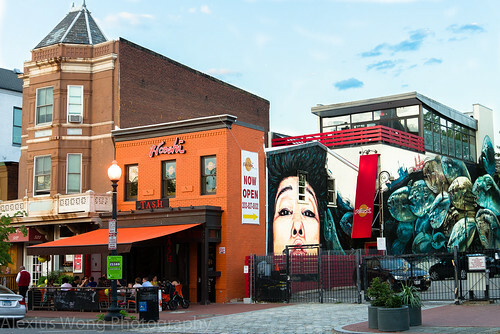 Ambar is located in the Eastern Market region of DC within walking distance from Capitol Hill. The 8th Street SE corridor has become a hotspot for new and trendy restaurants catering to those seeking some culinary adventure. 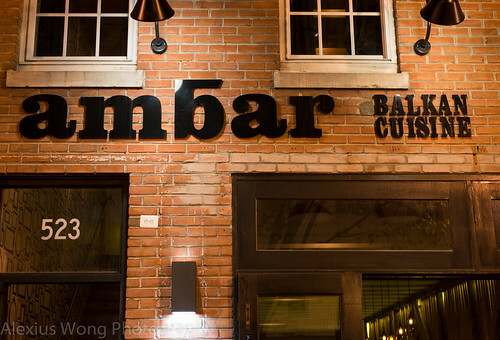 Ambar is one in that crowd, and it touts itself as serving Balkan cuisine. Run by a bigwig restaurateur in the DC scene, Richard Sandoval, whose nationwide and local restaurants range from Asian Fusion to Modern Latino, this appears to be the odd one out both in his culinary styles and in the local culinary scene. With a fairly warm night giving us a precursor of better weather to come, we decided to take our seat in the small outside patio, as well as for me to get some good light for my photo shots. The theme of this locale is that of small plates, tapas like, which we ordered a series of them for this sitting. The first to land on the table was from the Kajmak Bar. The name denotes an unaged cheese from the Serbia-Croatia region and I was curious enough to try something new. We ordered this dairy dish topped with crab mixed with Ajvar, a Serbian eggplant-red pepper sauce, crowned with pickled green chilies. Large pieces of Lavash chips, Turkish pita, were served as the scooping utensils to this dip. Taking my first bite, I was surprised by the clean and mild flavor of the Kajmak, tasting like light cream with the texture of chevre but without the distinctive flavor of its aged cousin. The crab mixture on top was a bit of a mismatch with the cheese since there was no discerning flavor of its sea-sweetness nor was there any distinctive presence of the Ajvar sauce, which made the use of the luxurious seafood a bit of a waste of ingredient. The slivers of pickled green chilies was the right match for the mild cheese, and I was relishing them much like how I loved my grandmother’s pickled chilies that she even packed in her handbag on our trip to Hong Kong in the 80’s. Perhaps another topping instead of the crab meat would have made this more successful since I was thoroughly enjoying its other plate partners. A trio of roasted mushroom crepes, known as šumske pečurke in Serbian-Croatian, arrived like little stuffed parcels. The first bite into them brought some excitement to this taster. 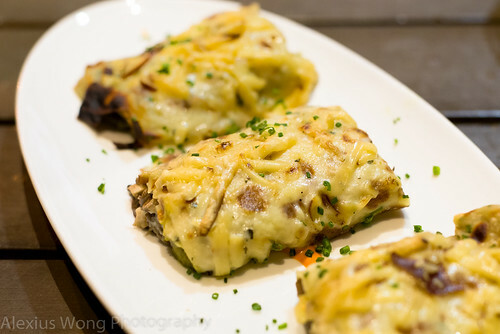 The lacy and thin French-like crepes wrapped a stuffing made with rich creamy bechamel infused with slices of roasted mushroom that lent its meat-like texture and woodsiness to these delectable squares, reinforced by the creaminess of nutty Gouda cheese gratinéed on top. The red pepper emulsion brought a bit of sweetness to each bite and it was the right complementary partner to this vegetarian delight. If weren’t for my sense of fairness and equity, I would not have split the last parcel with my dining partner. The next dish to arrive was Grilled Calamari with Gremolata. 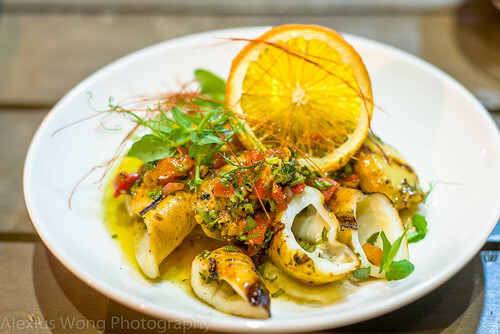 A pretty and bright dish arrived with pieces of fresh calamari bearing grill marks topped by the Gremolata sauce consisting of citrus flavors, roasted red peppers, fresh herbs, and olive oil. The pieces of mollusk were quite tender with a slight bitter note from the grilling, compensated by the sweet-sour and fresh-tasting sauce that I could not get enough of. Pieces of chili “thread” were a curiosity for me, and I could not stop popping them into my mouth, recognizing its vegetal flavor identity with the bare hint of its spice heat. 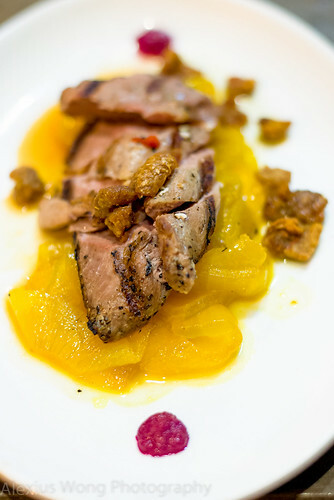 This well-executed dish points towards a skillful and thoughtful kitchen. Grilled Duck Breast was next on the line-up. Pieces of the poultry arrived sitting on a bed of cooked onions with pieces of duck crackling strewn around. The meat pieces were still quite succulent despite being cooked a bit past what we had ordered, matched by the slightly sweet onions cooked with saffron and orange juice hinting of its floral and citrus bouquet. But those pieces of crispy duck fat – what can I say? Even for this health nut, I couldn’t resist popping them into my mouth as I savored their crunch and salty fattiness in the mouth (I have been known to buy a bag of crackling once a year). The allspice jus added another interesting note to each bite, albeit a rather mild one. 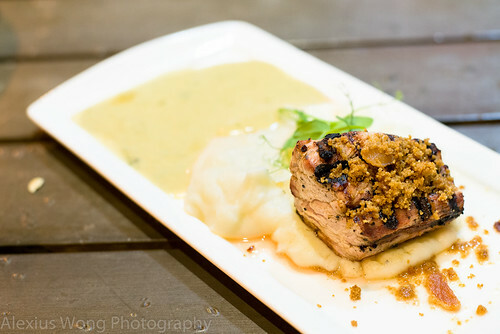 The last savory course was Bacon and Peanut Pork Tenderloin. A slab of tenderloin was heavily grilled, paired with some mash potato. Not knowing what this dish really was since there was a slight mix-up in the ordering (we were expecting Pork Belly and Sour Cabbage), we were guessing at what the elements were. The sauce tasted interesting and familiar at the same time, hinting of mustard (a bit hint), butter and tarragon, and of another familiar note not in its usual guise – Miso. Being heavily grilled, the pork was a bit dry on the outer parts but more tender inside, not tasting of anything else particularly interesting except for its porcine mildness. But it was that interesting sauce that saved the day. The pork served a role more like a vehicle to mop up that tantalizing sauce akin to how some French dishes are made with the sauce being the star on the plate. The sweet and salty bacon peanut crumble on the meat was also another interesting note that brought this dish beyond the banal. After the list of savory offerings we sampled, we felt quite sated and satisfied with our meal. However, our waitress tempted us with the house dessert that has been listed as one of the 40-must-have’s in DC – Forest Gnocchi. 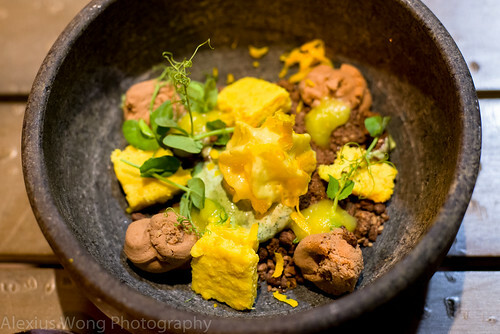 A chilled Korean stone bowl (a creative use of the usually heated one for Bimbap) contained the following ingredients listed on the menu: chocolate mousse, bitter orange cake, ground chocolate, orange gelee, tarragon gnocchi, passion fruit espuma with black tea sauce. Wow, wow, wow! Talk about gastronomic titillation at its best! I could not stop tasting all the high-quality and well-executed disparate ingredients with their fruit, sweet, chocolate, citrus, and tannin (tea) qualities that came together to create an amazing gestalt effect. The shoot of baby basil leaves added the refreshing and unexpected herbaceous note to the already polyphonic symphony of flavor notes. I am glad that we decided to take the leap of faith, and I have found my latest must-have dessert as of today. 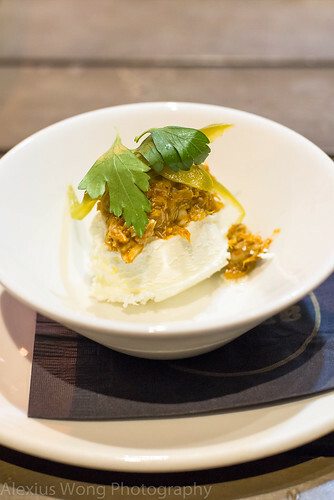 Ambar is an interesting gastronomic experiment by a seasoned restaurateur who knows what he is doing with ingredients that are uncommon but not lacking in flavor. Despite the small misstep in the Crab and Kajma dish, I was impressed by the execution and chemistry in the pairing of elements as in the Mushroom Crepes with its woodsy goodness and rich bechamel, the tender Calamari with the lick-the-bowl citrus Gremolata, the quality Duck Breast paired with floral sweet onions punctuated with crispy fatty duck crackling, and saving the best for last, Forest Gnocchi with the myriad of flavors that came together as an epicurean summit on my tasting buds, as I felt grateful that they are now at their optimum tasting level. Yes, Ambar is worth visiting for some culinary adventure, even more so with reasonable prices for this level of cooking. With my worries of my tongue issues aside, I can now concentrate on my tennis elbow from a Yoga session that same day. Oh well.